If you’ve been reading my blog for a while now, you’ve probably heard me tell the story behind the creation of this blog… I started this blog because I wanted to write and because I love graphic design (and all the nerdy behind-the-scenes HTML and CSS stuff). I was prepared to write about things I love, but I was not prepared to use a pinterest strategy, SEO, or other tools that help drive traffic to your blog. It can be overwhelming to jump into the world of blogging (but I wrote a series about blogging for beginners to help you out). There’s always something to improve upon! To combat the long looong list of things I want to do with my blog, I’m taming my ambition by tackling my to-do list, one thing at a time. Recently, I’ve been focusing on my Pinterest to *hopefully* get to the point where Pinterest is major source of blog traffic for me. After spending way too much time researching Pinterest strategies and reading posts of people doing this and that and all these things to grow their Pinterest… I didn’t even know where to start! Most people simply recommend buying plans like Board Booster or Tailwind… But if you’re a college girl or simply ballin’ on a budget like me, it just doesn’t make sense to spend the money on those Pinterest tools ATM. No fear, friend. 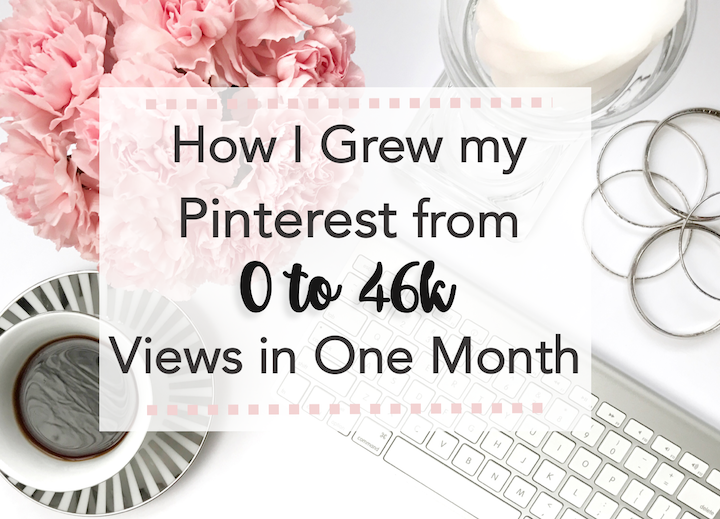 I haven’t spent a dime on my Pinterest, and I grew my Pinterest views from 0 to 46k in just one month! No, it’s not too good to be true! I’m dishing alllll my Pinterest strategy tips right here for ya, so you can grow your Pinterest, too! I will say I haven’t seen a huge increase in traffic to my blog from Pinterest, but driving traffic to your Pinterest first is key! I’m not here to brag about my views or anything, I just want to show you that it’s possible, and it’s possible to do it fo’ free. Here’s Pre-Optimized-Sad-Kristen-on-Pinterest. No SEO. No Pinterest strategy. I was just doing my thing, and getting about 1k daily views to my profile and pins. Here’s Post-Optimized-Happy-Kristen-on-Pinterest. Within one month (October 7 – November 7) of switching to a business account and working on my account, I’d gone from 1k to 30k views. I was ecstatic. It worked!! Here’s Current-Happy-Kristen-on-Pinterest. The growth didn’t stop after one month. My views have still been rising steadily, thanks to all the tips I’m about to show ya, and I’m currently getting around 46k views and counting. Still don’t believe me? Check out some serious stats on the left side of this screenshot. That’s over a 4000% increase in the views to my Pinterest profile. That’s crazy to me! Pinterest strategy really works, even if you’re a SEO beginner like me. Again, this hasn’t translated into a crazy increase to my blog views, but we’ll get there. So, without further ado, here’s my (100% free) Pinterest strategy that I used to grow my Pinterest account to 46k monthly views! 1. Switch to a business Pinterest profile. Like Instagram’s business profile, Pinterest for business allows you helpful insights and stats for your profile and pins, which is super helpful for growing and building your Pinterest account. I didn’t see the need to start a whole new account, so I simply switched over my personal profile to ‘business’ and set it up (very similar to my Instagram profile) for my blog. This simple step verifies your blog and connects it to your Pinterest profile. Under ‘settings’, stroll down to ‘Website’ (like shown below) and follow the steps to verify your blog. Verifying your site will make adding pins (and rich pins, in step #4) to your blog posts a breeze. SEO time, friend! Honestly, I’m just getting my feet wet in utilizing SEO for my blog posts, so I’m no expert. With SEO for Pinterest, it’s important to remember that Pinterest is a search engine, so you want to optimize your profile for what people are searching for. This means, adding your blog’s name/description to your name on Pinterest. I found that most bloggers make their name their own name, followed by a ‘|’ and then their blog name or type. My ‘Business Name’ on Pinterest is ‘Kristen Shane | College Faith & Lifestyle Blogger’, which would allow me to pop up when people search for this type of blog, and it lets people know what I’m about, right off the bat. I recommend making sure your Pinterest username is short and readable, or even the same slug as your other blog social media. I also changed my profile photo to match my blog Instagram to build cohesiveness across platforms. Your Pinterest ‘About You’ is a great place to add some SEO or simply explain who you are (and what you’ll be pinning) right off the bat. Mine is simply ‘college girl, christian, creator of KristenShane.com, & collector of everything pink’. Keep is short & sweet! This is where things get a little sticky. You can enable ‘Rich Pins’ with your business profile, which basically gives you a leg up for easy blog-post-pinning (which is a suuuper simple way to up your Pinterest strategy! ), which is a huge help in the long run. Applying for rich pins is relatively simple, but uploading your blog images with the appropriate metadata (to get that cool bold title and description to pop up automatically) isn’t so easy. It took me some figuring out, so I hope this tutorial can help make the process easy for you. Basically, when you upload your pretty graphic or image to your blog, you can do it so that it’s already loaded with your title and description, which will automatically transfer to Pinterest, in the form of your pretty little rich pin! Make sense? When you upload the image, the ‘Alt Text’ is your rich pin title, and ‘description’ is your description! I self-host with WordPress, but these attributes should be the same regardless of platform. 5. Clean up your boards. It’s allll about the SEO, remember?! This means you can optimize each and every one of your boards. This means giving up your creative titles for SEO ones. I did this for allll my boards, and changed the names from things like “Tame Your Name” to “Hair Styles”. Here’s a look at my boards, after optimization. I wrote all my titles in caps for a cleaner look, and added short descriptions for each. I also chose board cover photos that were simple/pink/described the board’s pins. Important – This is my best pinterest strategy game-changed to date. After I did this (optimized board titles and descriptions), I saw an immediate increase in re-pins traffic to my boards. No joke. Immediately, people were repining things from many of my board, because they could find them, thanks to SEO! I never believed any of the posts I read with ‘game changing’ or ‘magic’ solutions to Pinterest, but simply optimizing your board and profile with “Pinterest as a search engine” in mind will really do the trick. 6. Last, but not least, get yo’ views without spending yo’ money. Finally, to increase your views like I did, all you have to do it: pin things. Yep, pin things. That. Is. It. I haven’t bought any fancy plan to auto-pin for me. I simply pin a couple things I like, (along with sharing my blog posts, in the form of shiny new rich pins) a few times a day. That’s it. I spend a few minutes, a few times a day, pinning things I like. Now that your profile is optimized, you simply have to pin away. Easy peasy! I’m not trying to trick or scam you. These really are allll the steps I’ve taken to grow my Pinterest profile by 4000%! I truly hope this post has helped you learn the easiest Pinterest strategy to seriously improve your pinning-game. If you have any questions, any pinning ‘wins’, or simply wanna chat, feel free to drop me a comment, or shoot me a message at kristenshaneblog@gmail.com. I love chatting with y’all. As I’ve mentioned before, I’m working on my first Q&A post, so you can drop your Q’s here, too! If you’re still reading here, God bless ya! This may be my longest post to date, but I worked so hard on this and I really hope it helped! I love this! I’d love to read a followup post on how you got your blog views to increase. Pinned! This is great Kristen! I started using Tailwind and did notice that the # of posts is limited until you have to start paying, so I haven’t really used it lol. I never understood rich pins, but after sitting down with this post, I’m hoping I set the metadata correctly with my blog. You’re so full of information and I’m so glad you shared this! Aw thank you, Dianne! I really appreciate your sweet words! I haven’t even used the free trials, I just don’t want to get used to it and then have to pay. I really hope this post can help solve those issues. Very helpful post! I love it! God Bless you & thank you for this- I’m gonna sit down and optimize all of my Pinterest soon, since I made and named all my boards in like 7th grade and they appear quite childish. So excited, I can’t wait to see what this does for your blog views! Blessings to you, love!! And I wish you the best of luck with the optimizing. It can be a little tedious, but it truly was worth the effort for me! Mine were the same way, and it was crazy to see the benefit of changing them. I’m waiting to see changes in my views too, but I’ll definitely update with progress. Wow, Such a big help thanks so much!